Washington law for crosswalks states when a pedestrian or bicyclist is attempting to cross a roadway in a marked crosswalk or other designated crossing area, such as a street corner with no marked crosswalk, the driver of any vehicle is legally required to yield to that bicyclist or pedestrian. 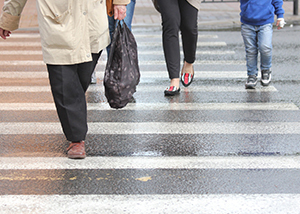 Because pedestrians and cyclists are more likely to be killed or severely injured in an accident, Washington law generally places the duty on drivers to yield to pedestrians and cyclists. However, if a pedestrian or cyclist is crossing outside the marked crosswalk or designated crossing area, then the pedestrian or bicyclist is required to yield to motorists. The operator of an approaching vehicle shall stop and remain stopped to allow a pedestrian or bicycle to cross the roadway within an unmarked or marked crosswalk when the pedestrian or bicycle is upon or within one lane of the half of the roadway upon which the vehicle is traveling or onto which it is turning. For purposes of this section “half of the roadway” means all traffic lanes carrying traffic in one direction of travel, and includes the entire width of a one-way roadway. No pedestrian or bicycle shall suddenly leave a curb or other place of safety and walk, run, or otherwise move into the path of a vehicle which is so close that it is impossible for the driver to stop. Subsection (1) of this section does not apply under the conditions stated in RCW 46.61.240(2). Whenever any vehicle is stopped at a marked crosswalk or at any unmarked crosswalk at an intersection to permit a pedestrian or bicycle to cross the roadway, the driver of any other vehicle approaching from the rear shall not overtake and pass such stopped vehicle. RCW 46.61.240: Crossing at other than crosswalks. Where curb ramps exist at or adjacent to intersections or at marked crosswalks in other locations, disabled persons may enter the roadway from the curb ramps and cross the roadway within or as closely as practicable to the crosswalk. All other pedestrian rights and duties as defined elsewhere in this chapter remain applicable. Between adjacent intersections at which traffic-control signals are in operation pedestrians shall not cross at any place except in a marked crosswalk. No pedestrian shall cross a roadway intersection diagonally unless authorized by official traffic-control devices; and, when authorized to cross diagonally, pedestrians shall cross only in accordance with the official traffic-control devices pertaining to such crossing movements. No pedestrian shall cross a roadway at an unmarked crosswalk where an official sign prohibits such crossing. The driver of a vehicle shall yield the right-of-way to any pedestrian or bicycle on a sidewalk. The rider of a bicycle shall yield the right-of-way to a pedestrian on a sidewalk or crosswalk. If you are injured in an accident as a pedestrian, you need an experienced and knowledgeable personal injury lawyer in Spokane on your side. The attorneys at Parke Gordon Law Firm will work hard to get you the compensation you deserve. Contact the law office of personal injury attorney Mat Parke today for a free consultation. This is your opportunity to speak with an experienced personal injury attorney about your case for free. Call (509) 482-7274 to get started on receiving a fair settlement from your personal injury case.